Psychological researchers study genetics in order to better understand the biological basis that contributes to certain behaviours. While all humans share certain biological mechanisms, we are each unique. And while our bodies have many of the same parts—brains and hormones and cells with genetic codes—these are expressed in a wide variety of behaviours, thoughts, and reactions. To explore these questions, let’s start by focusing on a specific disease, sickle-cell anemia, and how it might affect two infected sisters. Sickle-cell anemia is a genetic condition in which red blood cells, which are normally round, take on a crescent-like shape (see Figure 1). 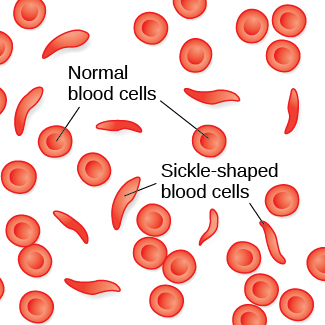 The changed shape of these cells affects how they function: sickle-shaped cells can clog blood vessels and block blood flow, leading to high fever, severe pain, swelling, and tissue damage. Figure 1. Normal blood cells travel freely through the blood vessels, while sickle-shaped cells form blockages preventing blood flow. This is precisely the situation that Charles Darwin describes in the theory of evolution by natural selection (see Figure 2). In simple terms, the theory states that organisms that are better suited for their environment will survive and reproduce, while those that are poorly suited for their environment will die off. In our example, we can see that as a carrier, Luwi’s mutation is highly adaptive in her African homeland; however, if she resided in the United States (where malaria is much less common), her mutation could prove costly—with a high probability of the disease in her descendants and minor health problems of her own. Figure 2. (a) In 1859, Charles Darwin proposed his theory of evolution by natural selection in his book, On the Origin of Species. 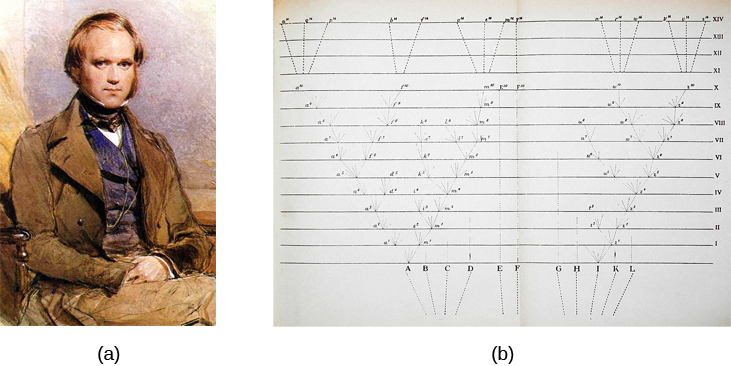 (b) The book contains just one illustration: this diagram that shows how species evolve over time through natural selection. It’s easy to get confused about two fields that study the interaction of genes and the environment, such as the fields of evolutionary psychology and behavioural genetics. How can we tell them apart? In both fields, it is understood that genes not only code for particular traits, but also contribute to certain patterns of cognition and behaviour. Evolutionary psychology focuses on how universal patterns of behaviour and cognitive processes have evolved over time. Therefore, variations in cognition and behaviour would make individuals more or less successful in reproducing and passing those genes to their offspring. Evolutionary psychologists study a variety of psychological phenomena that may have evolved as adaptations, including fear response, food preferences, mate selection, and cooperative behaviours (Confer et al., 2010). Whereas evolutionary psychologists focus on universal patterns that evolved over millions of years, behavioural geneticists study how individual differences arise, in the present, through the interaction of genes and the environment. When studying human behaviour, behavioural geneticists often employ twin and adoption studies to research questions of interest. Twin studies compare the rates that a given behavioural trait is shared among identical and fraternal twins; adoption studies compare those rates among biologically related relatives and adopted relatives. Both approaches provide some insight into the relative importance of genes and environment for the expression of a given trait. The egg and the sperm each contain 23 chromosomes. Chromosomes are long strings of genetic material known asdeoxyribonucleic acid (DNA). DNA is a helix-shaped molecule made up of nucleotide base pairs. In each chromosome, sequences of DNA make up genes that control or partially control a number of visible characteristics, known as traits, such as eye colour, hair colour, and so on. 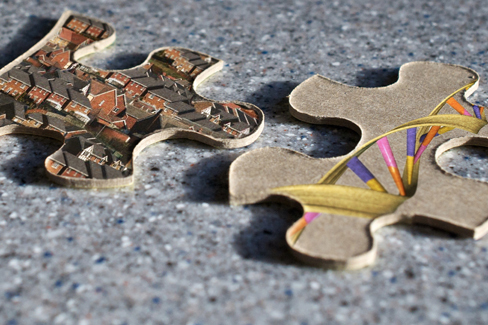 A single gene may have multiple possible variations, or alleles. An allele is a specific version of a gene. So, a given gene may code for the trait of hair colour, and the different alleles of that gene affect which hair colour an individual has. When a sperm and egg fuse, their 23 chromosomes pair up and create a zygote with 23 pairs of chromosomes. Therefore, each parent contributes half the genetic information carried by the offspring; the resulting physical characteristics of the offspring (called the phenotype) are determined by the interaction of genetic material supplied by the parents (called the genotype). A person’s genotype is the genetic makeup of that individual. Phenotype, on the other hand, refers to the individual’s inherited physical characteristics (see Figure 3). Imagine that a woman with a cleft chin mates with a man with a smooth chin. What type of chin will their child have? The answer to that depends on which alleles each parent carries. If the woman is homozygous for cleft chin (BB), her offspring will always have cleft chin. It gets a little more complicated, however, if the mother is heterozygous for this gene (Bb). Since the father has a smooth chin—therefore homozygous for the recessive allele (bb)—we can expect the offspring to have a 50% chance of having a cleft chin and a 50% chance of having a smooth chin (see Figure 4). Figure 4. (a) A Punnett square is a tool used to predict how genes will interact in the production of offspring. The capital B represents the dominant allele, and the lowercase b represents the recessive allele. In the example of the cleft chin, where B is cleft chin (dominant allele), wherever a pair contains the dominant allele, B, you can expect a cleft chin phenotype. You can expect a smooth chin phenotype only when there are two copies of the recessive allele, bb. (b) A cleft chin, shown here, is an inherited trait. Sickle-cell anemia is just one of many genetic disorders caused by the pairing of two recessive genes. For example,phenylketonuria (PKU) is a condition in which individuals lack an enzyme that normally converts harmful amino acids into harmless byproducts. If someone with this condition goes untreated, he or she will experience significant deficits in cognitive function, seizures, and increased risk of various psychiatric disorders. Because PKU is a recessive trait, each parent must have at least one copy of the recessive allele in order to produce a child with the condition (see Figure 5). So far, we have discussed traits that involve just one gene, but few human characteristics are controlled by a single gene. Most traits are polygenic: controlled by more than one gene. Height is one example of a polygenic trait, as are skin colour and weight. Figure 5. 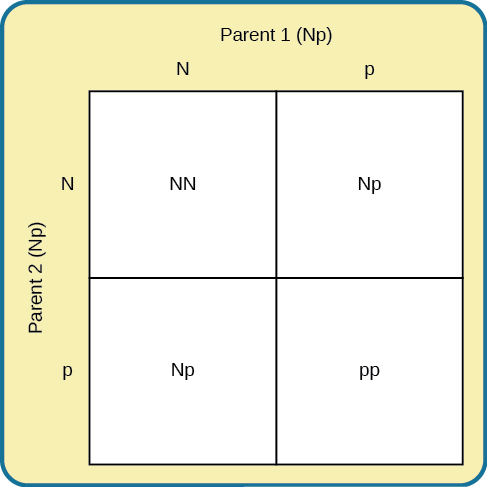 In this Punnett square, N represents the normal allele, and p represents the recessive allele that is associated with PKU. If two individuals mate who are both heterozygous for the allele associated with PKU, their offspring have a 25% chance of expressing the PKU phenotype. Where do harmful genes that contribute to diseases like PKU come from? Gene mutations provide one source of harmful genes. Amutation is a sudden, permanent change in a gene. While many mutations can be harmful or lethal, once in a while, a mutation benefits an individual by giving that person an advantage over those who do not have the mutation. Recall that the theory of evolution asserts that individuals best adapted to their particular environments are more likely to reproduce and pass on their genes to future generations. In order for this process to occur, there must be competition—more technically, there must be variability in genes (and resultant traits) that allow for variation in adaptability to the environment. If a population consisted of identical individuals, then any dramatic changes in the environment would affect everyone in the same way, and there would be no variation in selection. In contrast, diversity in genes and associated traits allows some individuals to perform slightly better than others when faced with environmental change. This creates a distinct advantage for individuals best suited for their environments in terms of successful reproduction and genetic transmission. Another perspective on the interaction between genes and the environment is the concept of genetic environmental correlation. Stated simply, our genes influence our environment, and our environment influences the expression of our genes (see Figure 6). Not only do our genes and environment interact, as in range of reaction, but they also influence one another bidirectionally. For example, the child of an NBA player would probably be exposed to basketball from an early age. Such exposure might allow the child to realize his or her full genetic, athletic potential. Thus, the parents’ genes, which the child shares, influence the child’s environment, and that environment, in turn, is well suited to support the child’s genetic potential. Watch this video for an engaging primer on the epigenetics of twin studies. Genes affect more than our physical characteristics. Indeed, scientists have found genetic linkages to a number of behavioural characteristics, ranging from basic personality traits to sexual orientation to spirituality (for examples, see Mustanski et al., 2005; Comings, Gonzales, Saucier, Johnson, & MacMurray, 2000). Genes are also associated with temperament and a number of psychological disorders, such as depression and schizophrenia. So while it is true that genes provide the biological blueprints for our cells, tissues, organs, and body, they also have significant impact on our experiences and our behaviours. Human Genetics by Rajiv Jhangiani, Ph.D. is licensed under a Creative Commons Attribution 4.0 International License, except where otherwise noted.